When thinking about holiday gift giving, why not consider a rug? I for one really enjoy receiving home decor as a gift. 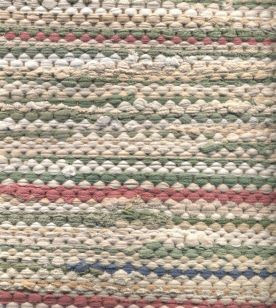 Rugs USA offers a great selection of rugs in a variety of styles and prices. I love area rugs, they are scattered through out my home. They look stunning on our hardwood floors and keep our feet warm during the cold winter months. They offer pretty much every rug you can think of, so finding the perfect one shouldn't be too hard. They have braided, shag, the Martha Stewart collection, and even oriental rugs. I was surprised to find they even carry outdoor rugs and some great choices for the kiddos! All rugs come in a variety of colors in sizes. Their prices are quite reasonable. You can find a great rug for in front of your door or a huge rug to fill your living room. There are lots of options here. We received this adorable 2x3 rug from their Stockbridge collection. It is a green-multi stripe that perfectly matches the way we are redecorating our bedroom. Dan has it on the floor on his side of the bed. He loves having it there to step on first thing in the morning so he isn't immediately on the cold wood floor. I love that it is functional and looks great! So, check out Rugs USA while you are shopping this year. They offer free shipping, along with a 30 day guarantee. I am sure you will find something wonderful for those special folks on your list!